RVNL functions as an extended arm of the Ministry of Railways working for & on behalf of MoR. It is empowered to act as an Umbrella SPV to undertake project development, resource mobilization etc. directly or by creating project specific SPVs or by any other financing structure found suitable. RVNL’s mandate includes mobilization of extra-budgetary resources through a mix of equity, and debt from banks, financial institutions, multilateral agencies like Asian Development Bank and bilateral agencies for project execution through PPP by the formation of project specific SPVs for Port and Hinterland connectivity. RVNL can enter into and carry on business relating to creation and augmentation of capacity of rail infrastructure on the fast track. (i) Projects to be executed by RVNL are assigned by the Ministry of Railways (MoR). (ii) Projects of other Central Ministries, State Governments and CPSEs also assigned to it. (iii) Powers have accordingly been delegated to RVNL to facilitate project execution. (iv) RVNL expenditure is largely dependent on the budgetary allocations by the Ministry of Railways. (v) Projects are also being funded by EBR (IF), IRFC, ADB loan etc. through MoR. (i) A consolidated management fee (inclusive of supervision charges) based on the average supervision charges allowed to Zonal Railways (8.5%). (ii) RVNL pays a dividend to Ministry of Railways on the savings out of the consolidated management fee. For 2017-18, Rs 167.0 crore was paid as dividend and Rs 34.0 crore as tax on dividend which is 2.88% of project execution cost. Thus, the effective management fee of RVNL was only 5.62%. They are in the business of executing all types of railway projects including new lines, doubling, gauge conversion, railway electrification, metro projects, workshops, major bridges, construction of cable-stayed Bridges, institution buildings etc. Since its inception in 2003, the Ministry of Railways has transferred 172 projects to them out of which 166 projects are sanctioned for execution. Out of these, 60 projects have been fully completed totaling to ₹167,777.00 million and the balance is ongoing.They have an order book of ₹686,836.20 million as on February 28, 2018 which includes 106 ongoing projects. (i) to carry out the disinvestment of 253457280 Equity Shares held by the Selling Shareholder in the Company. (ii) to achieve the benefits of listing the Equity Shares on the Stock Exchanges. Promoters of Rail Vikas Nigam Limited Company are: The Promoter is the President of India acting through the Ministry of Railways. The RVNL at the cutoff price of 19 is having P/E multiple of 7.79 and its listed peer IRCON International Limited is trading at P/E of 9.92 based on FY18 earnings. IRCON International is also a Railway PSU. The IRCON International last year came up with an IPO at Rs. 465 and listed around 400. However, the allottees got a chance to exit at the end of the day when the price went to 450. The CMP of IRCON International is at 397 which is a 14% discount from issue price. 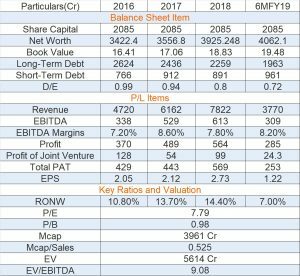 Review and Recommendation of RVNL IPO from IZ Team is: 3/10 (i) The company has shown excellent growth of 28% in revenue from FY16 to FY-18 and debt/equity is under 1. (ii) The company is an asset-light model as they provide consultancy service to railway projects and the project cost is financed by the Ministry of Railways. However, lately, the company is not getting funds on time due to non-availability of funds for Infra Projects and had to use their own funds which have put the strain on Working Capital. Many of their on-going projects are delayed due to land acquisition, removal of encroachments, utility shifting, etc. The company is dependent upon MoR for all these clearances before starting the project. (iii) The company outsourced manpower from Railways. As on December 31, 2018, the Company had 550 employees of which 389 employees are on deputation from Indian Railways. (iv) The Pricing of IPO has been done reasonable but its peer IRCON is trading at Discount of 14% from Issue price. The Infra- PSU as a sector is not in flavor. This issue is pure OFS and the company is not receiving anything so again big negative. MW Plz Reply…holding 1000 shares for 25 avg price….whts ur opinion….should hold for long term? Any Idea about how much listing gain?? 5-10% hona chaiye. Big game can also happen as ticket size is small. See my message. Now operators havs taken control in the share. Rakesh Jhunjhunwala has also applied in RVNL. Can we expect listing gain? I applied for 5 lots! @marketwizard what is your review about rvnl ipo ? I think metropolis is best one to buy.seems to be good pricing. Pricing of RVNL is also reasonable. Apply around 1 PM by seeing QIB and HNI quota. The listing of 5-10% gain can happened in RVNL but it is certainly not a long term bet. By Recommendation in the order. QIB and NII almost 50% each. I guess, we should apply..
SIR MERE DEMAT MEIN 2 QTY . TECHM KE SHARE HAIN , USKO MAINE TENDER V KIYA HAI … KYA WO ACCEPT HOGA ? Avoid this IPO until we see good QIB participation. Rail Vikas Nigam Limited mainly takes Railway Project from Indian Railways and executes them thereby get the commission. They get the loan from the Ministry of Railways for the execution of projects. However lately MoR has drastically reduced initial budget allotment of the year, for projects to be funded through budgetary support, to the extent that our Company has to utilize its own funds as working capital for many projects without getting timely reimbursement. The shortfall in reimbursement on this account as on February 28, 2019, is of 14,170 million. The uncertainty in timely provisioning of funds and reimbursement of the amount spent by the Company to carry out projects/works will impact the availability of working capital of the Company for implementation of projects; which in turn will impact the financial condition of the Company. Sheela foam ka ofs bharna chahiye ya avoid?? Thanks for guidance . Sirji aap ek OFS k liye bhi special column rakhiye na..
IRCON which listed last year came at P/E of 10. However, the Issue listed at discount.